It doesn't matter if you spend all your free time writing, or if you've never written a line of poetry in your life. If you'd like to try your hand at poetry, the Arlington Library has four different programs at four different branches in the month of April (National Poetry Month). There's Video Poetry, Blank Slate Create and Take, a Teen Poetry Workshop, and Make Your Own Magnetic Poetry. Click here to get more info. Poetry is often what and how we define it. This means that we can find poetry everywhere, even in the most unlikely of places. Like this. 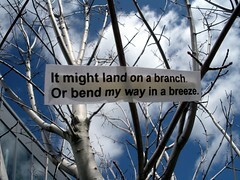 . .
Write lines from a favorite poem on a sandy beach, assemble twigs on a hillside, or chalk the sidewalk. Take a photo before it disappears and post it in the Free Verse group page on Flickr, or on the Academy's Fan Page on Facebook, or email your photo to freeverse@poets.org. Include the source of your lines in the photo caption. All photos of poems posted by April 15 will be entered in a drawing. Check out Free Verse Project for more info.